1. The IDF high command and government have known about the tunnels since late 2015. However, since Hamas and Islamic Jihad terrorist outbreaks from the Gaza Strip peaked in the past eight months, they determined after interminable debating that the time had come for Israel to reach a conclusion on one of its two fronts: either in the south against Gaza or the north against Hizballah, or else be in danger of being squeezed by both. The message conveyed to Hizballah by this operation is that Israel is not going to war. Neither is Israel striking Hizballah’s strategic assets – only cautioning the Lebanese terrorist group against sending any more branches of its bunker/tunnel network across the border. To make this point crystal clear, the IDF spokesman reiterated that the operation against the tunnels would be confined to Israeli territory, conveying an implicit pledge to refrain from combat outside the country. The Netanyahu-Eisenkot strategy for the Gaza Strip is mirrored on the Lebanese border. Operation Northern Shield is confined to the Israeli side of the Lebanese border, just as in the south, Israeli troops are pinned down to defensive positions on the Israeli side of the Gaza border and restrained from tackling the Palestinian Hamas. The counter-tunnel operation was moreover used cynically to distract from the delivery on Tuesday of the second $15m instalment of Qatari cash to Gaza, a widely criticized sop to the Palestinian terrorists. This strategy, which Netanyahu carries forward in his newly added job of defense minister, has boosted the self-assurance of Hamas and the pro-Iranian Islamic Jihad in the Gaza Strip . It will have the same effect on the belligerent leaders of Iran’s Lebanese proxy. Israel really can’t defend itself and It’s Afraid to Try. Keep pushing a major war off until they eventually they have the assets to win. Why wait they get stronger by the day? Hamas laughing with Arab oil money. mafiaosa. and Hezbollah laughing that the weak mouse idf too scared to destroy a tunnel in lebanon. not these excuses for jews like a bibi with his pipi and yes men weak jews spiritually and mentally. we need a yehudi warrior to squash hamas and destroy hezbollah and take on russia and send russia packing home to Moscow bleeding red blood. Every Petro-Dollar going elsewhere for weapons to attack Israel and others in the Middle East only goes into the Pockets of the Merchants of Death and is one less Petro-Dollar for the Iranians, Hamas Gazans, Hezbollah Lebanese, Syrians, and Yemenis Houthis to provide and live a life of liberty and prosperity for posterity instead of their choosing perfecting a purposeless process of their societal suicides. When the time and will comes to defend Israel there will be many we need Yehudah Maccabee, Shimon Bar Kochba and Ariel Sharon’s rising up at the precise time, as Iran, Hezbollah, Hamas, and Others have chosen Devastation over Creation of Middle East Peaceful Resolutions Solutions. Northern Shield is a Defensive Operation but does not preclude the Preparedness for Bigger Wayward Winds of War if a Counter-Attack is required for Self-Existence. G-d, Jehovah and Allah still have provided that Covenant with Abraham’s Israel. These Threats and Actions by Lebanon, Iran, Syria, Yemen, with Hezbollah, Shia, Hamas, and Houthis will be met and kept in check as necessary as they attempt to use their valuable resources to build brave new weapons while among their people continue to live in fear, poverty, and lack the freedom to do anything about it. It is these Nations and Terror Groups really showing they Fear Falling from Power, so they attempt a Conflict that I have no Fear, they will come to Regret Sooner not Later! Only bad Jewish exaggerations here! Out of the total sum for help, a minimum of at least 10% if not even more sometimes, goes to the very poor. Once again, Israel is being Righteous and Sends Its Own Message we are defending our Homeland by destroying Tunnels meant to attack us on Israel Borders. This send the message Israel will also Reserve the Right to prevent any First Strike Attack on Missile Site Location, Supplies, and Building them. Israel is using Patience in Wait and if necessary will respond based on need to survive against any massive devastation preparedness, attempts, or real invasions. A Defense is proper until a Major War does come and then Offense will be just as Righteous to Survive by returning Devastation back from where it came from anywhere on Earth! This is not a Threat it Righteous Vigilance with Righteous Counter Attacks for Israel Survival and all Hope that Day of Doom and Gloom Never Happens. But the Heads Hezbollah, Iran’s Shia, and Hamas with complicity of Syria know no bounds of cunning and if they come, the Will to be Done, will nonetheless the IDF. Preparing for War against Israel is just folly as IDF prepares to use Patience to Defend Israel is the wiser move, devastation can always happen later if the Righteous Defense requires it? No more sending Jewish messages, this harms our BDS movement! Nobody is listening to your messages, stop! Netanyahu and Eizenkot, a coward duo. Israel deserves better, but certainly not an Ehud Barak who has proven that he is infinitely worst then any of the above. You are right and that is what I concluded years ago with Gaza. Israeli leadership is more concerned with their financial ties with the EU than defending and destroying its enemies. Jews historically win battles but loose wars. They have to start thinking like Prussians not sheep. Debka is wrong on this one. Netanyahu is an artist, not a bulldozer, and war is an art. Hamas and Hezbollah will be destroyed when the time is right for Israel, no wars on their terms. Debka always criticizes yet never offers any solutions. The fate of your weak Netanyahu is in the hands of the Muslims, the great fighters of Hizbullah, more precisely at the hand of the fierce Hawk of Lebanon, the great Hassan Nasrallah. It is now at his will to down any second he wishes the Jewish PM, and this only by launching 10 or 20 rockets over the border. Then, the populace will throw the Jewish PM out of power, lynching not being presupposed excluded! But hey, he traveled to Qom in Iran where he furthered his religious studies, he knows everything, and he’s very good, and been allowed to kiss the good left hand of the Ayatollah! However, it is not clear why so many states and organizations, including some traitor Sunni dogs, talk bad things on his account and on the account of his peaceful army Hizbullah. Hezbollah, come on baby light my fire! Make a damn move, say somethin’, or sneeze at least one time. 1. is would Bibi lie for political points? 2. within how many weeks/months does Bibi need his war to retain his power and keep him self out of prison? I normally agree with Debka, but I have to disagree with this one. I think Israel ones to provoke Hizballah in order to give it an excuse to take out their key weapons factories (especially those that will convert missiles into GPS-guided ones). If Israel makes one mistake (e.g. by entering Lebanese territory) – which is a risk – Hizballah will respond, thereby giving Israel the legitimacy to strike at key targets. I actually think it is a bold move, at least compared to its severe restraint in the South. BiBi always work in “diplomatic” way. IDF chief says Hezbollah tunnel operation to last several weeks ?? What about the missiles plants ?? Do you think Hezbollah will do nothing in the meantime ?? Get ready for some nasty surprises. If that is the case. Better have the Samson option ready. You will be needing it,sooner them later. All your enemies are at the gates.One day the people of God,Israel.Will turn back to there God.One third will be saved.God will destroy their enemies. God has a plan for each one of us.If we have believed in his son.Faith alone in Christ alone.The church age is coming to an end.The Tribulation will begin. The worst time in history. Today is the day of soulvasion. Tomorrow may be to late. If the muslim terrorists for a moment thought they could defeat Israel/Zion, they would not hesitate a moment to do so. Hizbollah is NOT gaining self-assurance, they are only trying to call out Israel/Zion to the evil UN. The intervening long 6 yrs from 2012 to today 2018 have seen Bibi twisting himself like a pretzel to politically survive after that political/military catastrophe and still get his sneak ****** action in on Iran, like the rest of the real Mensch who man to go to Tehran, the Clean Break Plan, and now he’s stuffed again, just like 2012. Which is a very very good thing. Again. The Logan Act has never been used because it is unconstitutional. Mueller knows that. Any informed person knows that. And if it could ever be used, it would apply to some of John F. Kerry’s activities, not to the people you have mentioned. The rest of your diatribe is just pure B.S. and has no connection with reality, fact, nor truth. Gophers on the Golan! – what gophers? Fill the tunnels with liquid explosive, seal up the Israeli side, and detonate it. In world war 1, the British dug tunnels underneath the German trenches and detonated 455 tons of ammonia based explosive. Apparently the explosion was so intense it was heard in London, and killed 10,000 german soldiers. 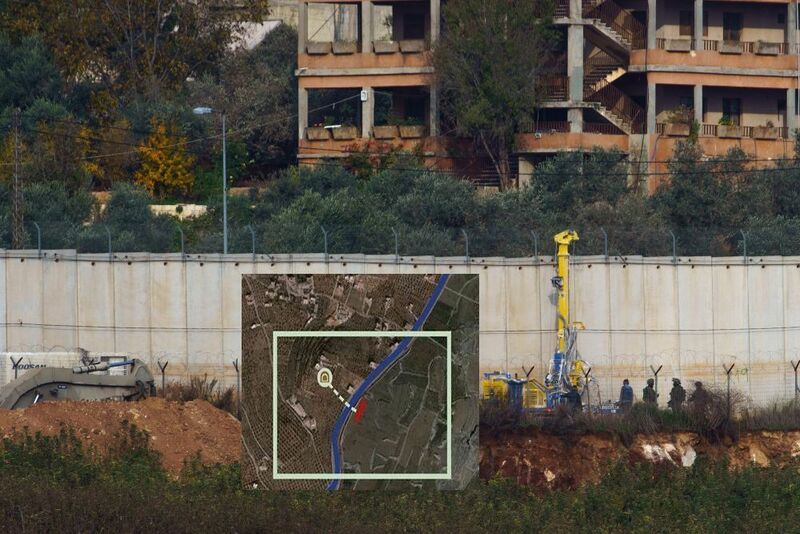 So I ask – why not build a tunnel toward every single village from where tunnels have been directed to Israel. Fill it with ammonia based liquid explosive. And detonate it when needed. Apparently, its OK to build these tunnels, right? Now I realize, after reading all of your above irrational non-lucid ramblings, that you suffer from a compulsive-obsessive psychological disorder based in extreme anger and frustration (or boredom). So I advise everyone to put William Teller on ignore. You are correct. After the crushing and humiliating defeat Hizbullah inflicted on the IOF in 2006, they are quivering in fear before them because they know if they dare starts another war Israel will be destroyed. Hizbullah is ten times stronger than it was in 2006. But now let us see who was Napoleon, what is Aleppo, and what is Waterloo. Napoleon was a French statesman and military leader. Napoleon emancipated Jews, as well as Protestants in Catholic countries and Catholics in Protestant countries, from laws which restricted them to ghettos, and he expanded their rights to property, worship, and careers. Despite the anti-semitic reaction to Napoleon’s policies from foreign governments and within France, he believed emancipation would benefit France by attracting Jews to the country given the restrictions they faced elsewhere. And, of course, he went ballistic on Arabs. After two months of planning, Bonaparte decided that France’s naval power was not yet strong enough to confront the British Royal Navy. He decided on a military expedition to seize Egypt and thereby undermine Britain’s access to its trade interests in India. But now, let us see about the British and the Balfour declaration. There was one Sir Isaac Bayley Balfour, (31 March 1853 – 30 November 1922) a Scottish botanist, Regius Professor of Botany at the University of Glasgow from 1879 to 1885, Sherardian Professor of Botany at the University of Oxford from 1884 to 1888, and Professor of Botany at the University of Edinburgh from 1888 to 1922. But is not this Balfour The Balfour! Let us see about The Balfour. No, we better start with The Balfour Declaration. First, the Balfour Declaration of 1926. This Balfour Declaration of 1926 is simply not the Balfour Declaration! This is because The Balfour Declaration is dated 2 November 1917 and not 1926. It is easy to observe that does not speak of Middle Est, and this is some other Balfour declaration. The Balfour Declaration was a public statement issued by the British government during World War I announcing support for the establishment of one state on the place where Israel is today. There was no mention, not even a suspect comma or a spooky Arabic word about such a thing like West Bank or Gaza. No, no, No, we better start with The Balfour. Arthur James Balfour, 1st Earl of Balfour, born 25 July 1848, and deceased 19 March 1930, was a British statesman of the Conservative Party who served as Prime Minister of the United Kingdom from 1902 to 1905. But, surprise! He issued the Balfour Declaration in November 1917 on behalf of the cabinet, but not as a Queen, not as a PM, but only as Foreign Secretary. Now, let us see about the Queen, how many queens, and about Edward VII who happens to be the King in place at that time. At the time of The Balfour Declaration, America was a well established state, good, powerful, and democratic. Let us see now why democratic. This is a prudent move. War with Hezbollah is inevitable. The question is, now that Iranian transport planes are landing in Lebanon instead of Syria, does Israel wait until Hezbollah feel all their chess pieces are in place and have the confidence to spring a surprise attack, or do Israel preemptively weaken their foundations now? There is no better time to do this because trying to do it in the middle of an actual war, would be foolish. I think it’s a shrewd move. The weak rush into war, with no plan of attack than ardent patriotism, but the wise combatant will use an attackers balance against itself whilst using as little effort or momentum as possible, while the attacker swings wildly in all directions, exhausted from his own exertion. I would assume the money from Qatar was allowed through because it’s wise to fight one enemy at a time, and since Hezbollah are more of a concern than hamas right now, and again…because of the Iranian backing and the Iranian transport planes now landing in Lebanon, this preemptive measure needs to be wholly focused on and Israel keeping its eyes on the road rather than needing to constantly check the rear view mirror as well. It doesn’t matter how weak someone is, keep hitting them in the face will eventually draw an unexpected response because they’ve grew numb to your bullish agression. Hizbullah and Hamas have more battle hardened fighters than Israel and they’ve studied the idf and aren’t afraid of them. Fighter bombers and missiles can only do so much, you’ll need to be on the ground.. something the idf lacks. Israel has a conventional military, hizbullah is a guerrilla warfare group dedicated to their cause. Russia is why Bibi is turning down the rhetoric..hahaha…Interesting. Actually, the IDF is very much on the ground at Israel’s borders but in case Hezbollah attacks Israel from Lebanon, the Russians will just watch and offer no assistance to Iran’s proxy. BTW, has there been any response yet to Lebanon’s President’s request to the Russians for the same s-300’s being supplied to Syria? Someone had it spot on above. Emotions do not win wars. Iran is the head of the snake. Useless scratching its belly whilst it has its head . Hamas , Hezbullah are bit players . Iran has to be taken down first. Whether Hezbollah is a guerilla unit or not is irrelevant. The real story here is that Jerusalem belongs to Almighty God……the real Creator, not some hate-filled venomous piece of fiction from any Muslim myth. If Jerusalem belonged to Muslims, their fictional God would not have allowed it to fall back into Jewish hands, nor would that fictional being allow the tiniest army to humilate the armies of 3 separate Islamic countries at once and destroy Egypts entire air force in one day. Muslims can boast all they want, but at the end of the day, all their crying and praying to a non existent god doesn’t amount to a hill of beans when they are fighting The Creator who said Jerusalem belongs to Him and that He will rule from Zion whether they like it or not. Lol, the Jehovah and Allah are both the same entity. That is the Demiurge who the Gnostics called Yaldabaoth the Chief Archon ruler or Drakon. But yes he is the ruler of this world. This is not a positive entity but a malefic entity. According to the ancient Gnostic texts, there is a creator God named Yadabaoth (Ilda-Baoth or Ialdabaoth ) who is described as the Child of Chaos, and was the son of Sophia (wisdom) in Gnostic Cosmogenesis. The important thing to remember with the story of Yaldabaoth is that it (he and she) is an artificially created life form said to be a lion-faced serpent, with its eyes were like lightning fires which flash. The so-called “UNIFIL” was tasked with preventing Hezbollah from rearming and doing all of this in the first place as part of UNSC resolution 1701. What a great job they’re doing in implementing the terms of the cease fire which ended the 2006 war! And all they have to say for themselves is the very last sentence in the quote above…………….should the United Nations change their name to the League of Nations (a more accurate reflection of their viability) now or maybe wait just a little while longer until the next major war breaks out? Do not forget about about all of the other militia’s including the group that is gathering in the Idlib province influenced by Turkey.